The Belleville Tables are modelled on the typology of the classic bistro table, but thanks to the selection of solid wood, veneer, melamine or HPL table tops, their appearance is highly variable. The slender legs flow in a continuous sweeping line from the splayed bottom along the central column to the table top. In star-shaped or paired configurations, they form bases for small and large bistro tables or dining tables.The colour and surface texture of the cast aluminium table legs, which have a black powder-coated finish, are nearly indistinguishable from the plastic frame of the perfectly matched Belleville Chair. And since the materials of the table tops and seat shells are either identical or harmoniously coordinated, the tables and chairs form a unified yet diverse group - a hybrid family of furnishings whose materiality resists classification. Thus the tables can be ideally combined with Belleville Chairs in bustling bistro settings as well as in sleekly modern galleries or diversely styled home environments.The Belleville Table is available as a small square or round bistro table with a star-shaped base or as a bistro and dining table in different widths and lengths with slightly arched T-legs. Depending on the model, the table tops come in solid wood, wood veneer, melamine or solid core material. Solid wood with oiled finish, natural oak, smoked oak or American walnut (26 mm); oak veneer in natural or dark oak (20 mm); melamine faced in white with smooth straight plastic edge (19 mm) or solid core material with black edge (12 mm) in the colours white or black.Solid core table top in black with anti-fingerprint coating. 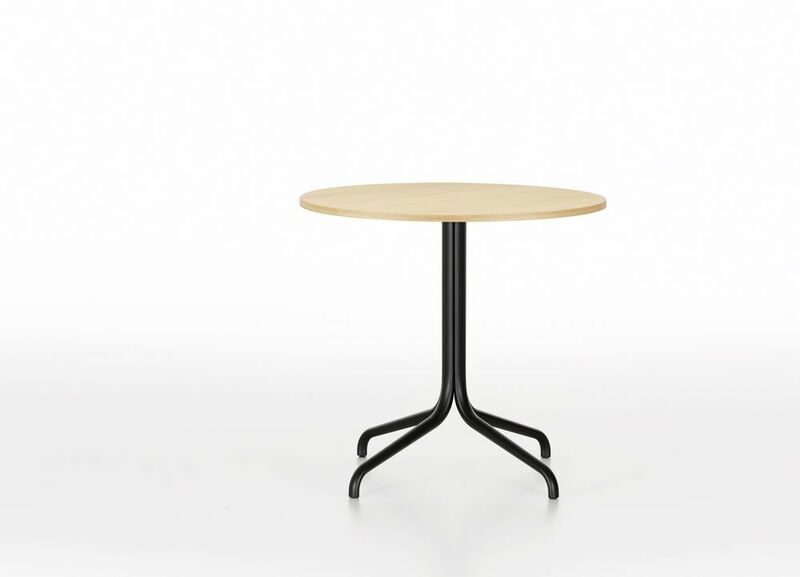 Table versions with a top in solid-core material and a powder-coated base are suited for outdoor use. The powder-coated bases are pregalvanised. Powder-coated with finely textured finish in deep black.